A journey of 3,000 miles begins with a stop in Philly. Masahito Yoshida, a 29-year-old mechanical engineer from Japan, plans to walk across the continent to Vancouver, British Columbia. The whole way, he'll be lugging a wheeled cart holding his tent, sleeping bag, clothes, and other belongings. Just as he says he did from Shanghai to Lisbon. That's right. China to Portugal. About 7,000 miles. The biggest leg of his legging it around the world. More or less. He did fly from Europe to Philadelphia, and, months from now, he'll fly from Vancouver back to Shanghai, to complete what he says is a more than two-year journey. His mother, of course, thinks he's crazy, he said in Japanese, his words translated by staff photographer Akira Suwa. Bulgarian doctors considered amputating parts of Yoshida's fingers because of frostbite from braving frozen mountains, he says. In Russia, a shepherd, unprovoked, started punching him in the face. In Ukraine, thieves took his gear, but it was recovered by police. Yoshida's greatest second-guessing, though, came when his grandfather died. He said he almost ended his quest in Lisbon, but decided to fly west instead of returning home. But the trip has apparently lived up to his dreams - of seeing the world up close and meeting lots of people. This planet has lots of different inhabitants, he said. He loved desolate Kazakhstan, where welcoming Muslims showed wonderful hospitality, and where the night sky blazes with stars. He'll never forget standing atop a 9,000-foot mountain, touching the clouds. Or seeing a wild camel. His only aches were in his feet, the first 10 days in China. He is on his third pair of hiking shoes, and his cart has worn out more than a dozen wheels. The youth hostel at Chamounix Mansion in Fairmount Park is his temporary base while he waits for a South Philly bike shop to repair his cart. Yoshida did find time to make his North American leg more shore to shore, by taking a bus to Atlantic City and walking back. 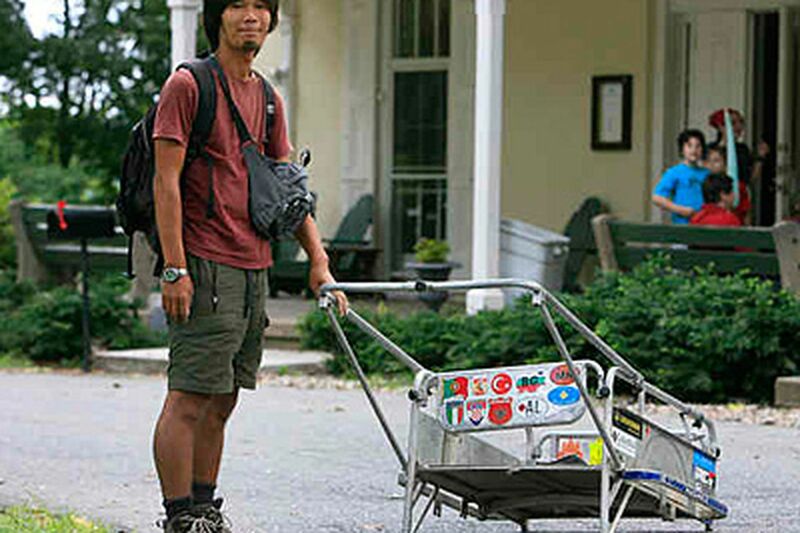 The shoes, the "rear cart," and much of his gear were supplied by sponsors in Japan, but he said he expected to shell out about $40,000 from his savings for the trip. He hopes to publish a book of his writings and photographs when he's done. And no, he wasn't inspired by a broken heart, he said. No bad breakup back in Japan. Yoshida was unsure what route he would be taking west. His U.S. visa is good for only three months, so he'll probably be crossing into Canada by mid-November. What will he do when he gets back to Japan? Sit and watch TV for a month? But he does hope to trek across the Sahara in Northern Africa, too. His message for Americans: Please drive carefully. If you see a man lugging a cart along a highway because the local sidewalks are too narrow, please slow down.